By the time you read this we’ll know if Team USA 2018 was able to keep the streak alive and make it four for four. The streak I’m talking about is Team USA’s perfect record in the three previous Motocross des Nations held in America. If that tradition holds during the 72nd running of MXdN at RedBud, Eli Tomac, Justin Barcia and Aaron Plessinger will lift the Chamberlain Trophy for Team USA for the first time in seven years. Here’s a quick look back at the three previous times the prestigious Olympics of motocross were held in the U.S.
Veterans Tim Ferry and Ricky Carmichael teamed with up-and-comer Ryan Villopoto to get the job done for Team USA at Budds Creek in 2007. It took 15 years, but America finally hosted its first Motocross des Nations in 1987, held at Unadilla, in New Berlin, New York. The 15 years refers to the first time Team USA fielded a squad in the prestigious international competition in 1972 when Brad Lackey, Jim Pomeroy, Jimmy Weinert and Gary Jones represented the red, white and blue in The Netherlands village of Norg. So, a decade-and-a-half after America began participating in the event, that it was finally granted it first hosting duties. The announcement of the ’87 Team USA squad was not without controversy. Jeff Ward and Rick Johnson were named to the team, which made all the sense in the world. Honda’s Johnson was a double MX champ in ’87, winning both the AMA 250 and 500cc crowns. Wardy was AMA Supercross Champ and runner up to Johnson in the 250 nationals, plus he had ample 500cc experience, so again, a no-brainer. The controversy came in the naming of the rider to represent Team USA in the 125cc class. Micky Dymond was class champ, and by the estimation of many fans, should have been the third rider. Instead the AMA named Bob Hannah, who by 1987 was riding part-time for Suzuki, hadn’t raced a 125 in five years and hadn’t raced des Nations since ’78. Regardless, the Hurricane got the nod and shocked everyone with his performance, which included a 125cc win and an amazing come-from-behind charge to fourth in class after getting knocked down Unadilla’s infamous Screw-U twice. An estimated 22,000 hardy fans endured rain and mud to watch their heroes do battle on home soil. Johnson, the absolute star of the ’87 domestic series, dominated the des Nations, winning both of his motos. With great rides also turned in by Ward and Hannah, Team USA beat the Netherlands by two points (5-7). Belgium was third with nine points. “I had a bad feeling we weren’t going to pull it off because the European teams, like the Belgians, are so tough and such good mud riders,” Johnson said. “But our team pulled together really strong. It was a long 20 years before America would once again play host to the Motocross des Nations. Budds Creek, Maryland, was the site of the second MXdN in America, where a massive crowd of 40,000 packed Budds Creek MX Park to watch a great Team USA squad of Ricky Carmichael, Ryan Villopoto and Tim Ferry do battle with the rest of the world’s best motocross teams. The problem with the ’07 team was overconfidence. Carmichael was the GOAT and it was his last motocross race – enough said. A young Ryan Villopoto was beginning to come into his own, had just scored the 2007 AMA MX Lites Championship (now known as the 250 national championship) and was looking to prove his mettle against the international stars. Ferry (filling in for an injured James Stewart) was great pick for a sub, a veteran known for being a rock-solid reliable finisher, a safe bet for not putting a wheel wrong all weekend. Team Manager Roger DeCoster did a brilliant job of keeping his team solidly grounded, even though they were heavily favored. His pre-race instructions to continue to be strong and steady, even if bad things happen, proved prophetic. Team USA had to overcome problems. Carmichael and Ferry both crashed early in their first motos, but DeCoster’s words of wisdom served as a guidepost and the riders beat the adversity and, in the end, it was a rout. All three Americans topped their prospective classes (Carmichael the best scorer in MX1, Ferry in Open Class and Villopoto in MX2). Villopoto was the surprise standout. He was simply brilliant, winning Moto 1, the combined MX1/MX2 race ahead of Australia’s Chad Reed and Carmichael, who charged all the way back to a podium after being caught up in a first-lap pileup. He then went on to win Moto2 as well, the MX2/Open. Carmichael went out with a bang winning the final moto of the event (MX1/Open) with Ferry taking second. It was a blowout with the USA winning with 8 points to second place France’s 34 and Belgium with 35! Ryan Dungey was the big star of the 2010 edition of the Motocross des Nations when it was held at Thunder Valley MX Park in Lakewood, Colorado, in front of a disappointing 17,000 fans during the depths of the recession. Team USA won that day in a tighter battle over Belgium by a score of 23-30. It marked the 21st time that USA had taken the win, and it was America’s sixth consecutive title. 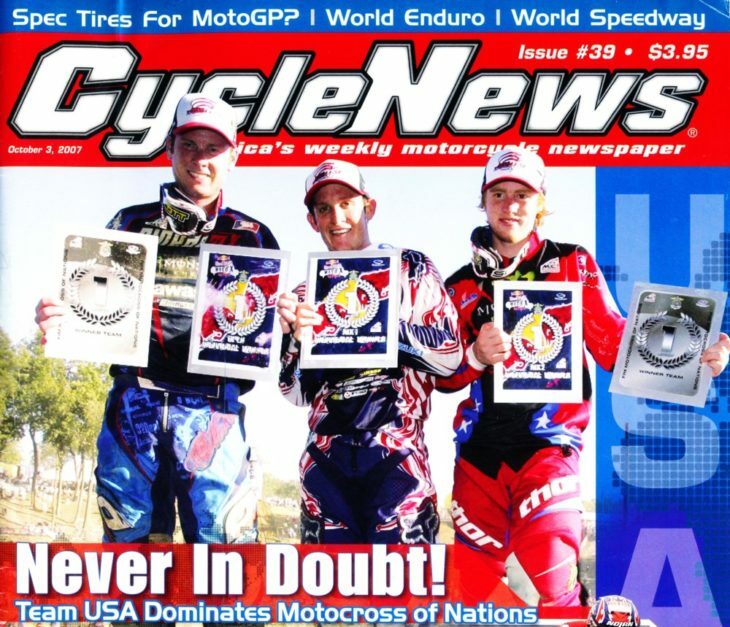 That year Dungey was teamed with Trey Canard and Andrew Short. Things looked ugly for Team USA from the start of the first moto (MX1 & MX2) when Canard tangled with fellow American Zach Osborne, who was representing Team Puerto Rico, and crashed. He was second to last at the end of the first lap. Up front Dungey was in a great battle with Antonio Cairoli of Italy. Dungey poured it on late in the moto and crossed the line 10 seconds ahead of Cairoli. Canard rallied to finish 12th, garnering valuable points after his disastrous start. In Moto 2 (MX2 & Open) Short was looking solid near the front when he was hit hard by New Zealand’s Ben Townley. Short was dazed and almost didn’t get going again, but after a long delay he was back underway and rallied to finish 13th. Canard finished seventh, but that meant with one moto remaining, USA trailed the Germans by five points, setting up an ultimate showdown for the title. With tensions running high, it finally all came together for the Americans in the final moto (MX1 & Open) when Dungey and Short turned in superb rides and finished 1-2, clinching the victory for the home team. American fans can only hope that Tomac, Barcia and Plessinger will keep that American home cookin’ tradition alive.